This is a commentary series I have only recently been introduced to. In many ways it is similar to the very popular Tyndale Commentary Series. I recently purchased M. M. Thompson's commentary on 1, 2, and 3 John and have appreciated what I have found in it. This is a fantastic way to get familiar with more volumes in this series! Bible students will be happy to know that there are 16 commentaries on New Testament books --- written by noted evangelical scholars --- that are available online for free. A select few of the commentaries from the IVP New Testament Commentary Series (InterVarsity Press) can be found online at the BibleGateway.com website. 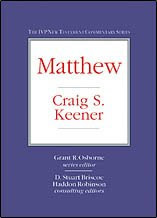 New Testament scholar Donald Carson describes the series this way: "... they are brief, simple, and designed to be immediately nurturing. Quite a few have now appeared, and if several are bland, several others are outstanding (W. Larkin on Acts, I. Howard Marshall on 1 Peter, Linda Belleville on 2 Corinthians, Rodney Whitacre on John)," in New Testament Commentary Survey, 6th ed. (Baker Academic). Grant Osborne is the series editor, with Haddon Robinson and Stuart Briscoe serving as consulting editors. Acts, William J. Larkin, Jr. Thanks to Jon Rising (Word & Spirit) for pointing this out! I have found Keener, Bock, and Fee very useful in this series. Of course, those authors all have a much larger commentary available for the same books they handled here, but this is a serious, clear, and accessible series. I would think a busy pastor could make great use of these commentaries. I agree with your comparison to the Tyndale series. I would add that the updated Expositor's Bible Commentary series is also in the same league. WOW! This is great. Thanks Jason!